My family is what matters most to me. I’m 51 and a mother of 4 (ages 14 – 26). I wanted to be healthier, more active and stronger not just for me, but for the people I love. I wanted to set an example for my family that we each possess the tools to master our wellness and vitality. Over the years I had tried various diet and exercise regimens, and I did enjoy a degree of success, but the results were not to the level I hoped for, and they were somewhat short lived. Achieving stable, long-lasting results proved stubbornly elusive. Then when I hit menopause everything became more difficult. My body stopped cooperating altogether, and I was constantly grumpy. My waist and hips expanded and I found myself napping in the afternoons. I started to accept the idea that there would be this new, less vibrant version of me. I just completed my P90x3 Challenge in October 2014 and with the holiday season and a busy schedule, I couldn't keep up with my strict diet and I didn't have the dedication to set aside time for exercise. I was tired, bloated and felt defeated - again! I was also becoming every moody - my excuse? Menopause! I told my husband, "I think I just have to accept the new me. I tried everything but nothing seemed to work -- and it's so hard to keep it up." Then one day I saw a very unflattering picture of myself, I looked weak, bloated, unhappy, and diminished. That was my wake-up call. I heard about Isagenix through Facebook. I asked a friend for more information. However, I hesitated. For some reason I was focusing on the negative comments I found online. However, weight kept coming back - and I finally reached my "it's time to panic" weight. I saw another close friend of mine who's using Isagenix. She's a yoga instructor and a life coach. I asked (again) my husband to read the ingredients and see if there's anything in it that's bad. He spent days reading up on the ingredients list. And finally he said, "There are lot of natural ingredients, plenty of herbs and the founder's from GNC so why not try them. If you don't like it or if it doesn't agree with you, then stop." I had 1-2 shakes everyday, cut down on dessert (my weakness) and in 14 days I released 6 pounds. I didn't think it was a big deal because I didn't think it would last. While browsing through the papers that came with my first order, I noticed information about the contest. If there's a fitness challenge to sign-up for, I'll be there. That's when I signed-up for my first IsaBody challenge. Some of my friends told me, "But you don't have a lot of weight to lose. As we age, our bodies change". They think I'm crazy to even think of joining the challenge - because in their minds I was already fit and small to begin with. I was starting to believe it until 6 months ago. But one thing I learned, we have to be what we want to be - what makes us happy, how we see ourselves and not what others think we should be happy with. That got me more motivated. "It's not about weight loss. It's about feeling great from the inside and having a purpose," I replied. "If I can find a way to help others feel good about themselves as they reach their menopause phase, I'd try and figure it out myself." I took my before photos early that morning. But when I was uploading the photos, I noticed that I needed to have one photo with date stamp and that day's newspaper. I just got out of the shower and asked my husband to (again) take my "front" before photo. He was really busy so he took it in the dining room by the kitchen. On day 30, to my surprise, with very minimal exercise (mainly walking around the block, about 1 mile maybe 3 times a week), I released another 8 pounds. I didn't think it was possible at all. I cut down on calories so it just made sense, right? The next 30 days coincided with my youngest son's Spring Jazz Workshop. Wednesday nights became my date night with my husband where we tried different restaurants in Montclair. I had my regular doctor check-ups and told my doctors that I lost weight because of Isagenix. To my surprise, one of them said, "I did Isagenix, too, and my daughter's using it, too." And the other doctor said, "that's great!" The next couple of months, I went on maintenance (meaning 1 shake a day on weekdays only). I did 30 minute exercise routine of strength, cardio and abs - at least 3-4 times a week. I had so much confidence in the better version of me that I was brave enough to do the zipline and the rock climbing to the very top - and someone thought I was the cruise ship's fitness instructor! It truly was a test to see if this nutritional program is sustainable and adaptable to my lifestyle. At the end of my first challenge, I was ecstatic. 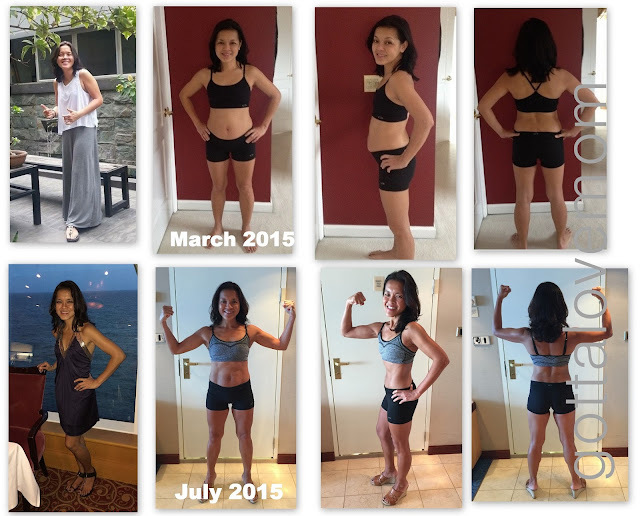 I was 123 pounds when I first used Isagenix, and had already released 6 pounds. The 16 week challenge helped me lose additional 5 pounds. Released a total of 11 pounds and 15 inches. Friends now call me "Benjamin Button" and my kids are happy that "Menopause Jenjen" has left the planet! I am still a work in progress that's why I'm on to my 2nd IsaBody Challenge. Let's do this - You and Me, Together! To sign-up and/or read more about IsaBody Challenge , click HERE. Note: Every transformation is different. The IsaBody challenge absolutely challenged me - mind and body. I believe in doing things in small gestures - baby steps so that you don't get overwhelmed that you'd feel like quitting/disappointed. Every transformation is different - we have different body types, mental health, eating habits and exercise routine. Like any anything else, staying healthy and fit requires commitment. The Isagenix System happens to be very effective to many people and it delivers a broad range of nutrients that is generally lacking in an average person's diet. There is no such thing as getting rich quick, and there is no such thing as losing weight fast. Being healthy is a lifestyle choice that requires effort, discipline and time. Please do your due diligence and speak to your doctor if you have medical condition. The weight-loss testimonials I presented, applied only to me, cannot be guaranteed and should not be considered typical.